Danny Hatchel took the leap and joined in on the family business in early 2014 as the Operations Manager at Med TECH LLC. Having 20 plus years’ experience in the corporate world as a Purchasing Agent and overseeing multiple other departments in a large Electronics corporation, he knew the medical device industry would provide an exciting challenge and an opportunity. 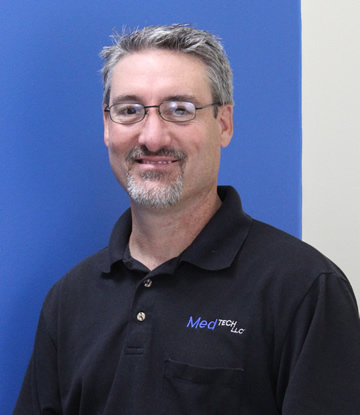 At Med TECH LLC, Danny is the primary member of management responsible for quoting, working with manufacturing on scheduling and obtaining needed materials and supplies for orders as they come in. The team he is a part of here at Med TECH with his brother- Jason Hatchel, sister in law- Teresa Hatchel, father- CB Hatchel and Med TECH LLC’s highly skilled staff of Quality personnel and machinists is something you can’t find in corporate America. These are people with integrity who genuinely care about each other, the customers, the quality of the products being manufactured, and the well- being of the patients that the medical devices are helping.